Sunday night, comedian turned entertainment and business mogul Steve Harvey took full blame for his beauty pageant host blunder that instantly made him a trending topic in news. In a recent interview for Black Enterprise’s Business of Entertainment issue, Harvey talked about his relationship with the Miss Universe pageant and dropped a tidbit about him serving as not only a host for the event, but as a business partner with WME/IMG. In September of this year, WME/IMG purchased the Miss Universe, Miss USA and Miss Teen USA pageants from Donald Trump for an undisclosed amount. Negotiating terms that will take his investment in the pageant beyond hosting duties, Harvey thanks his business partner Gerald Washington for helping to close his multiyear deal, and says he hopes to take the franchise to a new level. 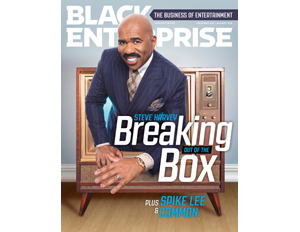 “If I take this and can do to this franchise what I’ve done with the Steve Harvey Show or Family Feud, it could be very successful for us,” Harvey tells Black Enterprise. Continuing to expand his brand both inside and outside of the entertainment space, the 58-year-old also talked about the recent release of his Easy Bacon line and his purchase of the only latex glove factory in the U.S., where he is expected to rake in $50 million in revenue thanks to his distribution deal with Walmart. 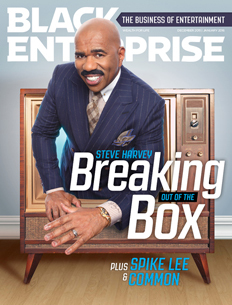 To learn more about Harvey’s many business ventures–as well as read our exclusive interviews with Spike Lee, Common and more–be sure to pick up the Black Enterprise Business of Entertainment issue on newsstands, January 26. 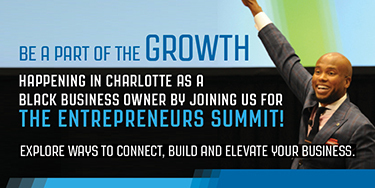 And check out our interview with Harvey on Our World with Black Enterprise, airing January 24 at 6 a.m. on TV One.